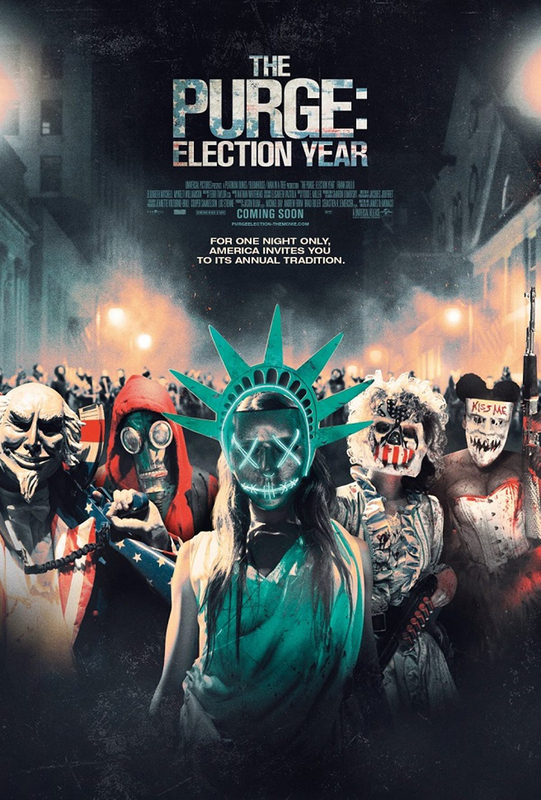 The Purge: Election Year reveals the next terrifying chapter that occurs over 12 hours of annual lawlessness sanctioned by the New Founders of America to keep this country great. It’s been two years since Leo Barnes (Frank Grillo) stopped himself from a regrettable act of revenge on Purge Night. Now serving as head of security for Senator Charlie Roan (Elizabeth Mitchell), his mission is to protect her in a run for president and survive the annual ritual that targets the poor and innocent. But when a betrayal forces them onto the streets of D.C. on the one night when no help is available, they must stay alive until dawn… or both be sacrificed for their sins against the state. I’ve write quite a few reviews about how this third instalment of the trilogy wasn’t really good. But a friend really wanted to catch it, so I decided to watch it and provide a review coming from someone who hasn’t caught the first two movies. Ok, I have a low tolerance for gore, cruelty and sadistic elements. So this disturbing film was like a nightmare come alive for me. Although the story takes place two years after the events of The Purge: Anarchy (2014), in March 2025, I couldn’t help but felt that this film seem to be a parallel with the current US presidential run. Hillary versus Trump, female against male, and no surprise (if you’ve watched the film) to know who the director is siding. The film is sadistic and cruel, yet it felt so believable as the backstory behind the Purge was realistically true. Senator Charlie Roan (Elizabeth Mitchell) and Leo Barnes (Frank Grillo) are the protector of human rights and equality, yet it was difficult to fault the on-point survival-of-the-fittest mentality the “founding fathers” had. That’s the harsh fact of life. What made the film successful as a thriller was how it manage to create the air of tension by showing the audience what was going to happen. While many films will resort to jump scares, The Purge: Election Year does it by making me hold my breathe waiting for things I guess might happen to happen. The great chemistry between the Senator and Leo Barnes was so good that you won’t be surprised if they start smooching in the show (which of course, they didn’t). I like how the director developed the characters of the underdogs, Joe (Mykelti Williamson), Marcos (Joseph Julian Soria) and Laney Rucker (Betty Gabriel). They belong to the lower class, they are on the receiving end of the Purge and they do whatever it takes to survive and protect their asset. I was able to feel for all the 3 characters, and there were so many moments in the film when I mumbled to myself, “oh no, he’s going to die, he’s going to die.” when Joe was so possessive over his convenience shop. I like the touches director James DeMonaco put into the film. Instead of having one single lead surviving through the trilogy, he had a small but significant character surviving and evolving in the different films. Dante Bishop (Edwin Hodge) is the person who went through the 3 films, knowing the backstory of this character makes me want to go back and watch the previous 2 films. So if you are wondering whether to catch this film when you haven’t watched the previous films, I would definitely encourage you to go ahead. If you have watched the previous ones, here’s a review by a friend who had watched all three! This was originally intended to be a prequel, telling the story of the very first Purge. This idea was scrapped when Frank Grillo accepted James DeMonaco’s offer to reprise the character of Sergeant Leo Barnes. James DeMonaco had written and directed every single film of the series. Edwin Hodge’s character is in all three of the Purge movies. In this one, he is revealed as Dante Bishop. Check out The Purge: Election Year Official Website and Facebook Page! The Purge: Election Year is out in cinemas on 14 July 2016. It looks quite interesting and surely my hubby will love this one. Seems like a nice movie to watch, though not a priority. I seldom leave the house because of our baby. Would love to see it being shown in our country. This is not my type of movie. I would generally avoid storylines with too much gore. Heard from some friends that earlier parts were better. Hmm…this movie seems unclear to me. However, i’m hoping I can still manage to get a glimpse of it in the movies. The concept of The Purge has always been relatively shallow and super strange. I think it was created purely for the violence. I’ve seen the first two films and I really think that it’s pretty entertaining despite the gory scenes. Lol. I wouldn’t mind watching this either! Thanks for the review! I haven’t seen its trailer yet since I find it really scary though I have watched its part 1 I guess. I only read reviews. I am not sure if ever I’ll be giving this consideration of watching or what. It looks interesting especially if you try to follow the parallelism with the elections. It looks like a good screamfest of a film. I don’t think I even like the story line. I might just skip it!